LOVE BEING A NONNY! : BEACH! Headed to the beach today with hubs. The last time we were there THEY were with us. We sure are going to miss them. Hope you and your hubby have a delightful time together! Enjoy! By the way, I love David Crowder and especially the song "O Praise Him". When I hear it I always just have to stop and lift my arms and circle around looking at God's World and say "Thank You, Thank You" and my heart just fills up with praise! Don't you think that will be what heaven will be like? Blessings from one Nonny to another! Know you will miss the babies but try to enjoy!!!! Enjoy your sweet time with your husband! I know you will! Time alone together is a gift and it'll re-charge you to spend even more time with your littles! We will miss you, Nonny! 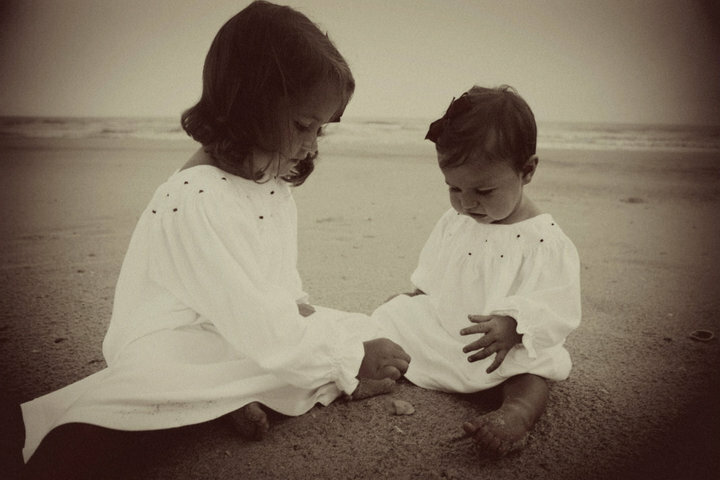 What a beautiful photograph of your granddaughters!!!! Love that photos! Beautiful girls! And thank you for your sweet comment today. I am actually single and 32.5. That's the problem- ha. But my Bestie mentioned in that post has been trying for about 5 years to have a baby. Love the picture of your little Grandbabies. They are so sweet! Do enjoy your time with hubby and try to get some rest and relaxation. The weather should be beautiful! Have fun! Love & blessings from NC! That picture of the girls is stunning...something that should be in a photography studio or magazine at the beach...ya know, in one of those little shops along an avenue by an ice cream parlor! i love the black and white pic! enjoy the time with your hubby! Have an awesome time..just you and hubby!! I bet you will have a great time...even without the 'darlings'. Soak up the sun! Hope you've had a great time! Let's Do It Again Soon!!!!! !